BELLVILLE — A planned project to revamp sidewalks to the north of the blue bridge on State Route 13 drew criticism at last week’s council meeting. Skip Hursh told council he has acquired the Dairy Belle business, just north of the bridge. He said if a sidewalk project is allowed to continue, it would take four of his nine parking spaces and eliminate an area where there are picnic tables. Putting in a new walkway would not “make up for the parking and seating loss,” he said. There are three property owners in the area, and they would all incur costs if the project is allowed to continue, said Hursh, who owns Mid-Ohio Roofing. He said he has given help to the village in a variety of ways, but added he can’t “still be a contributing member to the community” if the sidewalk project goes through. Council member Josh Epperson said work would be done within the highway right of way, under the project being done with the Ohio Department of Transportation (ODOT). Council members said the idea is that traffic going to Palm Park would be enhanced if the project goes through. The sidewalk would connect with a walkway going across State Route 97, leading to sidewalks which would go to Palm Park. He said he has put “over $20,000 down there” and he will consult a lawyer if necessary. Fred’s Garage and River Rock restaurant/bar are also located next to the bridge. He said it doesn’t work to assume people patronizing his business could use parking for those two entities. “I don’t have a right to be there,” he said. And that kind of access hasn’t been offered, he said. Village administrator Larry Weirick said he walked in that area with a relative, a child, and thought that area could be “treacherous.” The project would affect the “ingress and egress” to businesses there, he said. The idea is to continue the streetscape and make pedestrian traffic safer, he said. It will also “promote walkability” to the park, he said. The village was able to get 90/10 funding for the project, which will let the village complete it at a cost of $36,000 in village money, he said. There was discussion at the council meeting about the problem with traffic at the intersection of State Route 13 and State Route 97. A department of transportation study determined that traffic didn’t warrant installation of a traffic light, said Weirick. 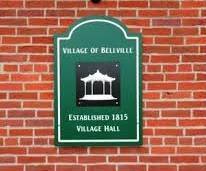 April 16 — council meeting, 5:30 p.m. Bellville Police Department; April 22 — planning commission, 7 p.m. village hall; April 13 — Clean up Charles Palm Park, 9 a.m. to 3 p.m.; April 19 — cookies and milk with Chief Ron Willey, police department, 10 a.m.; April 19 — Easter egg hunt, Amvets Park. 10 a.m.; April 24 — variety show auditions, 6 p.m.; April 27 — variety show auditions 9 a.m.; April 27 — Arbor Day, 10 a.m. bandstand; May 11 — dumpster day, 9 a.m.t0 3 p.m.